Project for this week... a Birthday Card for one of my nieces. 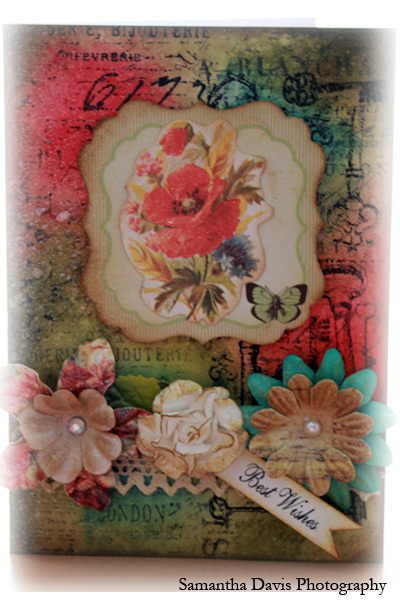 I am sooo loving Tim Holtz Distress Stains, the colours of the card are so vibrant. Starting with a blank white card, I covered the entire surface with a mixutre of Peeled Paint, Broken China, Wild Honey, Barn Door and Brushed Corduroy. I then stamped the entire front with different stamps in black ink. Paper flowers are from my stash, inked with Brushed Corduroy then sprayed with Perfect Pearl Mist - Perfect Pearl. 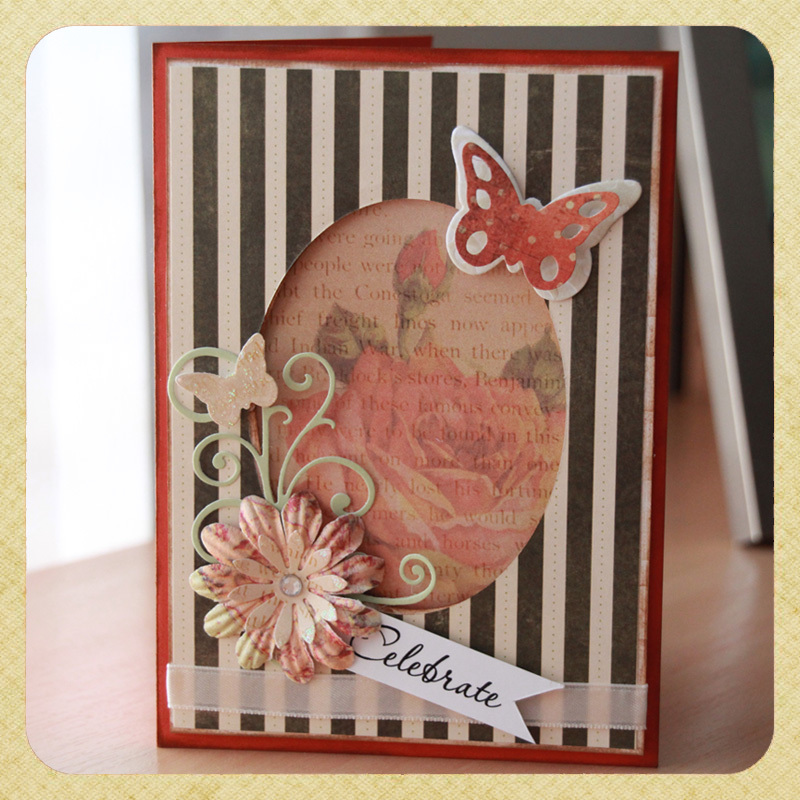 The die-cut label is from Kairsercraft 61/2" pad - Bonjour and the lace is from my stash too. stamp and then stamped on a tissue before stamping on the card. This was so much fun to make and another card I love! Would you like to get your hands on a 1yr RAKStar Membership for FREE!!! What's a RAKStar Membership? Hop on over an take a look at RAKscraps... part of the fun at RAKscraps is being a RAKStar Member which usually requires a $19.95 donation. BUT... for a SPECIAL LIMITED TIME ONLY - Everyone who buys MyMemories Suite Software using my $10 off coupon code will receive a RAKStar Membership FREE!!! How this works: Purchase the MyMemories Suite Software using my coupon code STMMMS22909. Email me a copy of your MyMemories Suite Software purchase using my code and I will send you a Gift Certificate to receive the annual RAKStar Membership... it's that easy :). Receipts must be dated between February 24, 2012 - March 31, 2012 to be eligible. So that is $39.99 for MyMemories Suite Software -$10.00 using my promo code = $29.99 you pay. You then receive $10 credit to the MyMemories Store and with this offer you will receive $19.95 RAKStar Membership, total value = $29.99. How awesome is that!!! What are you waiting for, get in quick for this incredible deal for the Best Digital Software on the Planet! Right Oh! 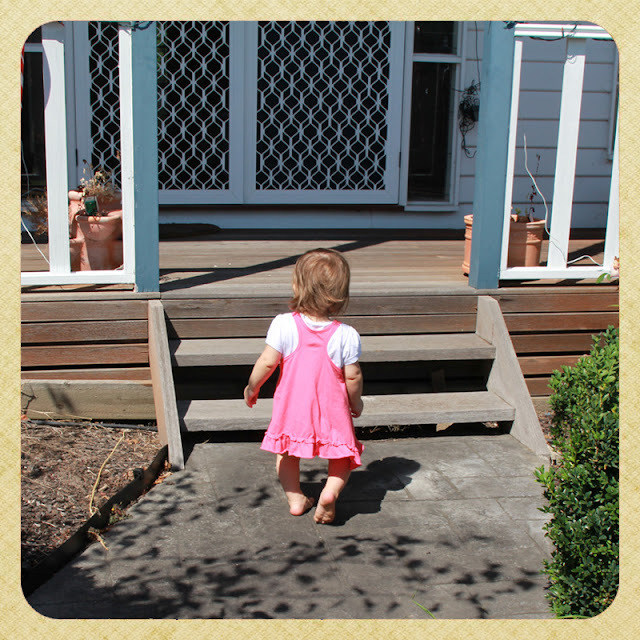 As I mentioned last Project Life post, I've changed things up a bit... I am loving the colour background, this definitely helps the photos standout more. 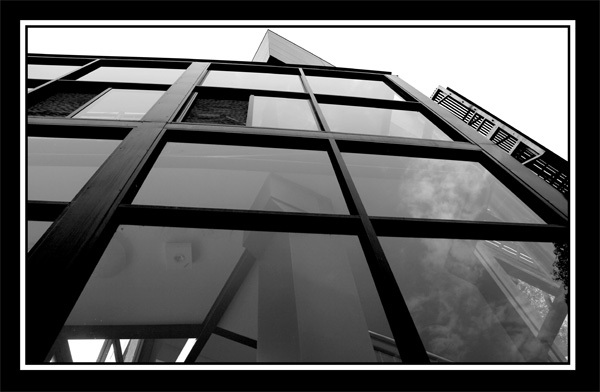 I have also been playing with the photo edges, from now on I will be including a mixture of the following... a slight vignette, a solid brown edge, an inside doodle line in either white or black. 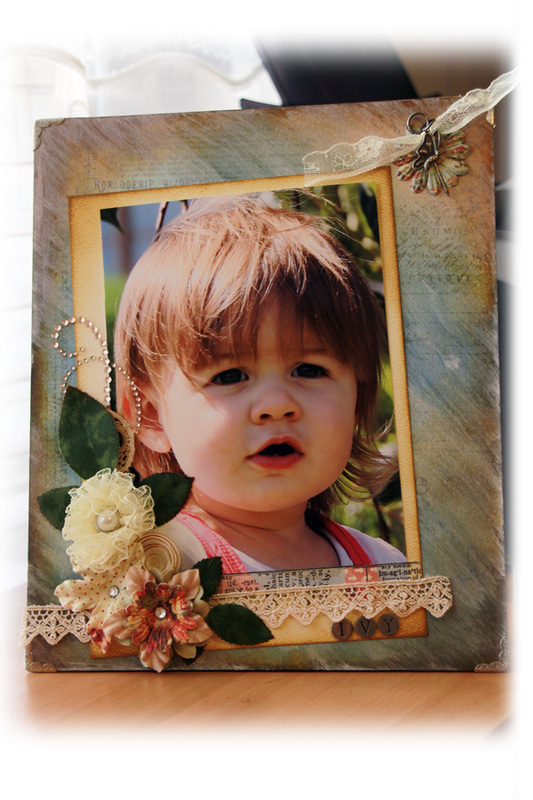 Loving the photo treatments so far but I feel the pages still need more, maybe an embellishment or two... we'll see! Yeah, yeah I know I'm bais...hehehe. Anyway, I was inspired by Tammy Tutterow's - Papillon Tag. I say inspired because what I came up with looks nothing like Tammy's tag...hahaha. I used a piece of art board for the base. With the assistance of an ink blending tool, frayed burlap and stormy sky distressed ink was added all over the board. I used a heat gun to dry the inks so I could then swipe white picket fence distress stain diagonally across the whole background. Again this was dried with the help of a heat gun so I could spray Perfect Pearl Mist all over. The photo doesn't show it but the background has an nice pearly sheen, so pretty. To finish the background off I inked randomly using different stamps and wild honey distressed stain. Once the stamp was applied I blotted off the excess wet ink to give the stamped images a faded look. The edges of the board and the yellow matt behind the photo were then edged with brushed corduroy. I added a strip of Symphony tissue tape, a piece of coffee coloured lace, flowers, leaves and bling to the photo to add interest. The yellow lacy flower was a bit of an experiment, I am quite pleased with the result so I can see myself making more of these cuties. A memo pin, paper flower, lace and a charm added to the top corner and to finish the whole frame off I added metal photo corners. My first EVER truly off the page, page project and I LOVE IT!!! Have you heard the exciting news!!! The Team over at My Memories Suite are offering live workshops! They are planning on touring the country but are still working on all workshop dates for the year. In the meantime the first stop is officially in Salt Lake City, UT! Woohoo... what an awesome way to meet new friends and have a great day of learning. Lisa J will be on hand to answer all your questions, as well as give you tips and a bit of hands on training. 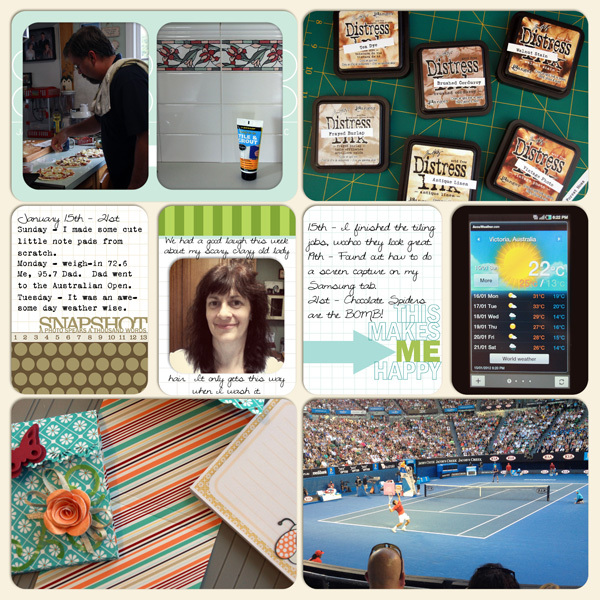 Julie of Leelou Blogs will be there as well to show you how to create your own blog wear using My Memories Suite. Last but not least Scott Jarvie of Jarvie Digital will also be there teaching a course on photography. Who wouldn't like learn tips and tricks on capturing the best pictures. Click here for more info!!! Tickets go on sale today. Happy Valentine's - Part 2!!! As promised here is part 2 of Valentine's Day, this is what I whipped up for Hubby's gift. You might remember I mentioned in this post Love is in the Air I was following Alissa Fast and her 29 Days of Love project which I shortened to 14 days...lol! I decided to make a flip mini album using tags. 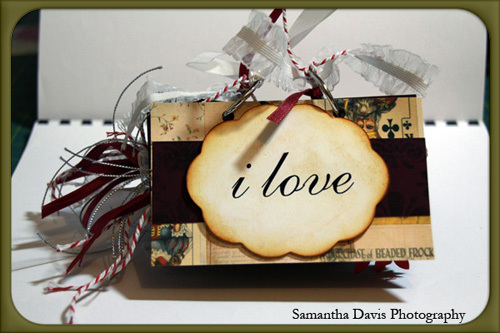 Basically each day's prompt starts with i love... so this was what I used for my front page. The label shape and words were done with the print to cut feature on my Cameo. 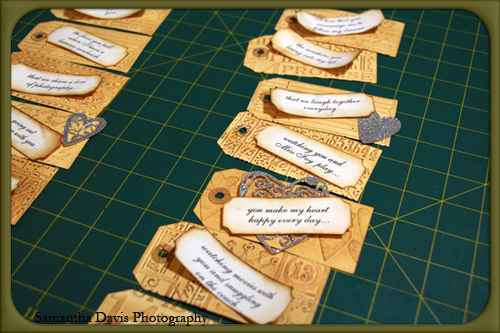 Inside pages under construction... each tag was embossed with various embossing folders by Tim Holtz and a couple of cuttle bugs, I think. I then inked each one with Tea Dye Distressed Ink. 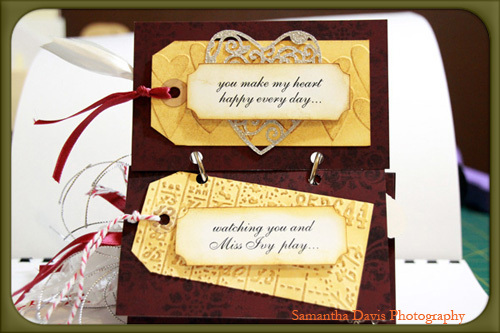 The labels were cut with my cameo again the print to cut feature, the font used Anastasia Script. I then inked all the edges to match the tags. The pop up was also cut with my Cameo, can I just say I am soooooo in love with this machine, I waited so long to get one and it was definitely worth the wait!! 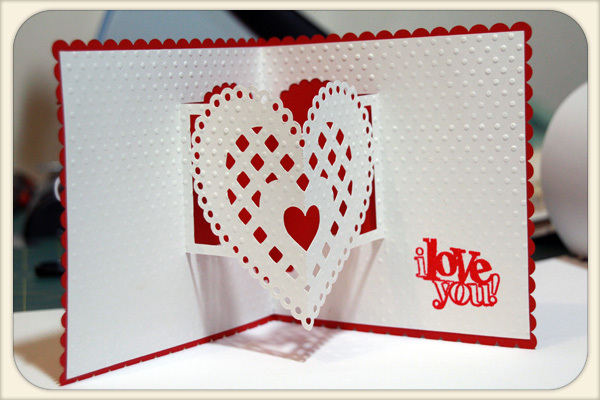 How awesome is that pop up :D, again I stamped the 'i love you' and embossed with clear embossing powder. I probably don't need to say that Hubby loved it...YAY! Love is in the Air, everywhere I look around because it's February...lol. 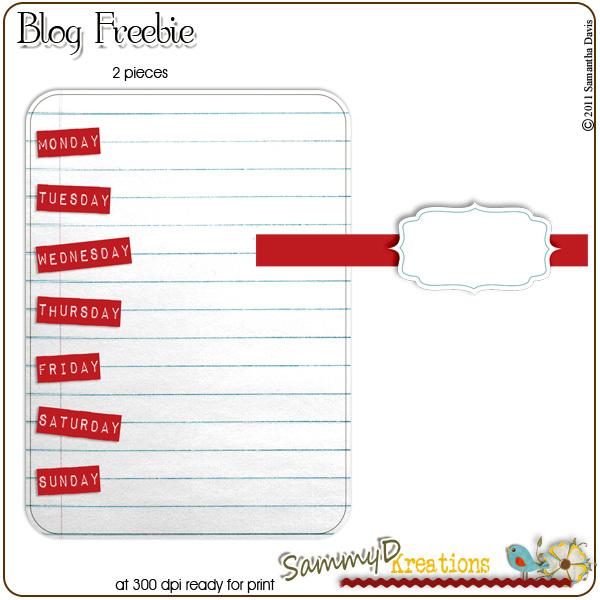 Come join me as I follow along the 29 days of love project on Alissa Fast's blog. 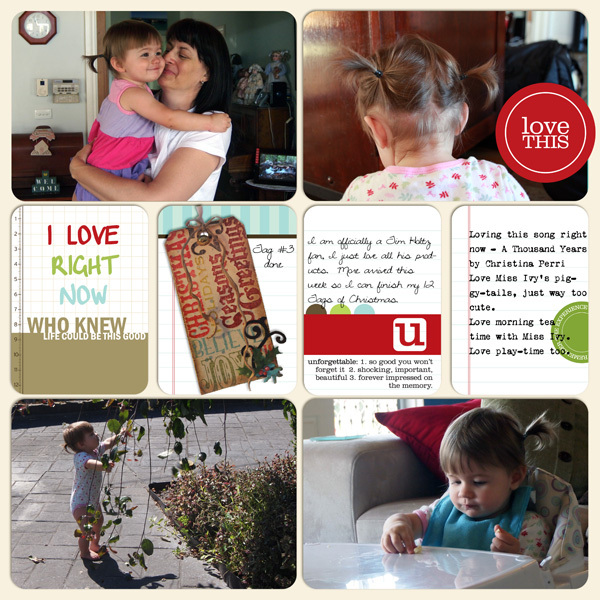 Each day Alissa gives a prompt along the lines of "today I love..." for you to do something with. I am going to make a 3x3 mini book (no photos) and only 14 days as it will be a Valentine's Day present for my honey... hope he doesn't read this post, eek!!! 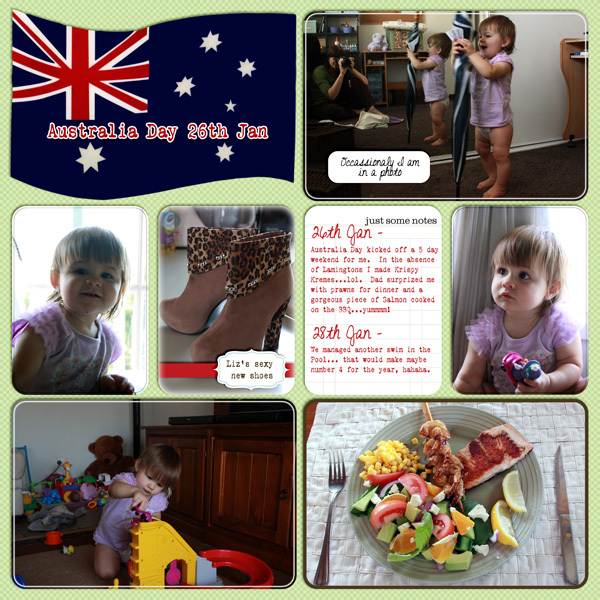 While I am enjoying seeing our weeks come together I am not sure I like the look of the pages...lol. I think I need to change the background colour to give the pages more pop, will definitely have a play with the next week's pages...hehehe. 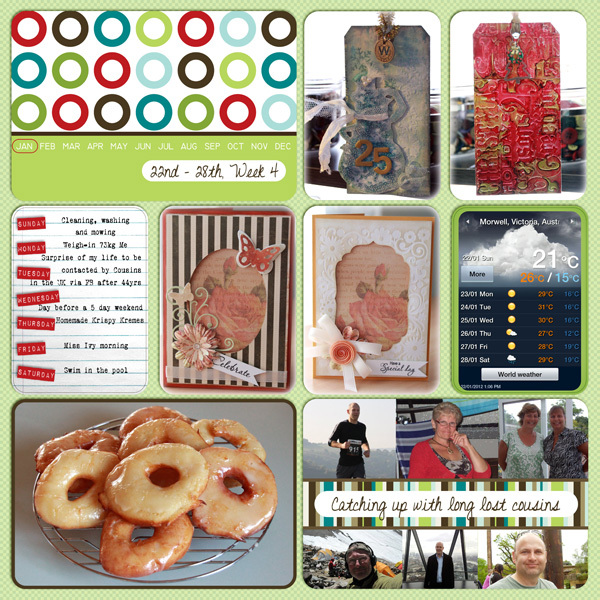 So I had me a bit of Tim Holtz time yesterday, not the man himself of course but I did play with lots of his products. 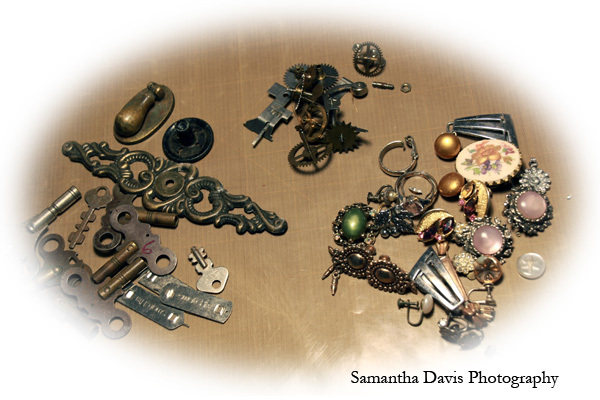 I love, love, love the vintage, distressed, grunge look but my efforts to-date were a bit sad to say the least so imagine my joy and delight at finding Tim Holtz products... heaven. I used a manila coloured 61/4" x 41/2" card for the base and inked around the edges with Burlap Distressed Ink. Paper is from - Vintage Timeless 61/2" Paper Pad, I ran this through my printer to add the Telegram message. Again I inked the edges with the Burlap Distressed Ink and used a pair of tiny scissors to distress the edges. Three different coloured Distressed Stains were used on the chipboard cogs, then edged with Burlap Distressed Ink. The charm was something I found in my stash and the clock was cut from a transparency, these I then attached to the card with a Trinket Pin. Once I had the basic idea of what I was going to do it didn't take long to put the card together at all. I love the result, so I am going to mark that as a WIN for my first vintage male card. Oh and word of warning if you decide to Google search Vintage Male Cards, the results may not be what you are expecting. I felt my eyes open a little wide at some of the images and I think I am pretty broad minded...lol! January that is, no really WHERE DID IT GO! I have managed to sort of keep on track with my crafting goals...scrap project finished, cards made and Project Life mostly done...hehehe. 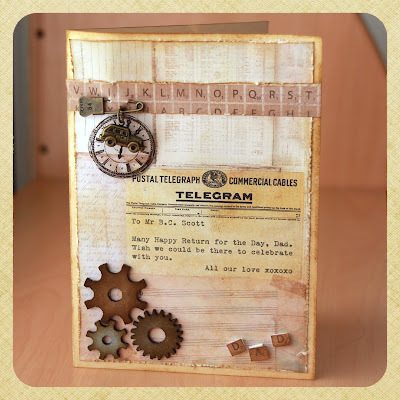 I am so in love with this card... starting with the mustard coloured card as a base, I embossed a piece of white card using a cuttle bug folder and lightly inked the surface with Tim Holtz - Antique Linen Distressed Ink. 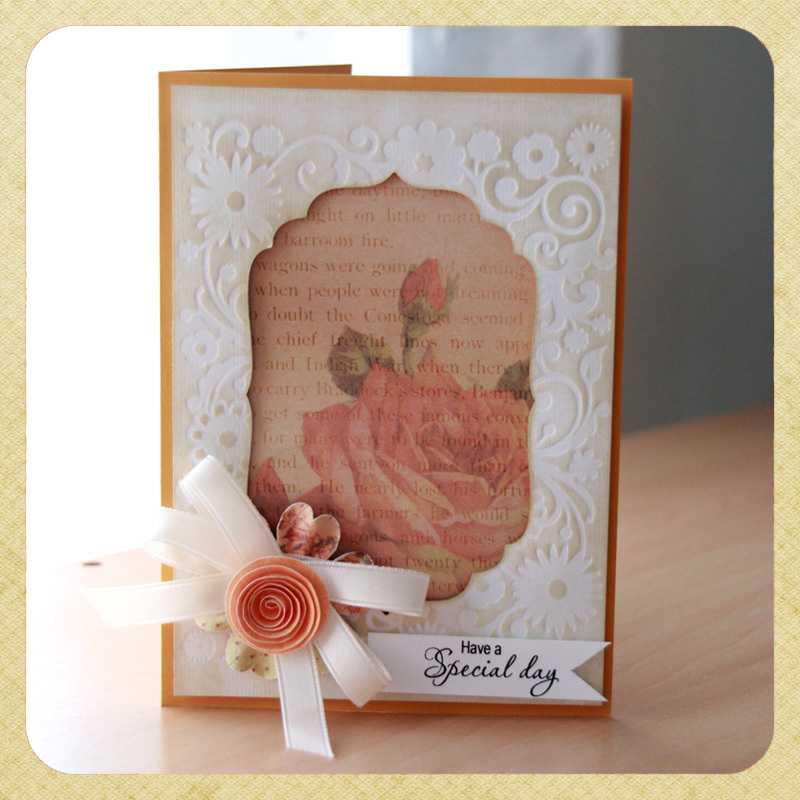 The rose paper is from a 6x6 Glitz Pack - Laced with Grace. 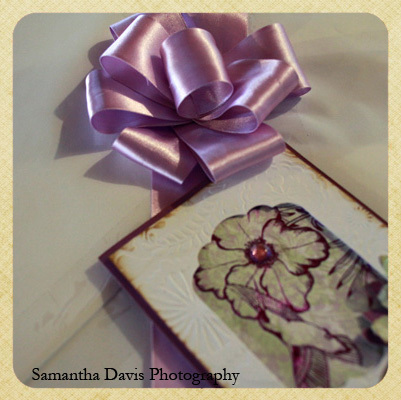 The little cluster is made up of a paper flower I had on hand, a ribbon bow and a MFT die-namics rolled flower. The little sentiment I printed out on Epson Matt heavy-weight paper and cut into a banner shape. I love this card just as much I think...hahahahaha. The striped paper is again from the Glitz Paper - Laced with Grace. 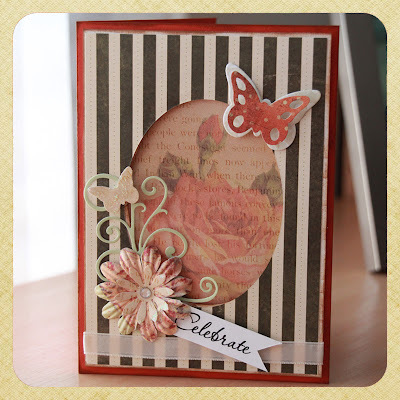 The butterflies and flourish are MFT die-namics too and again a flower from my stash. Add a bit of lace, a banner with sentiment and some sticklers to the little butterfly and middle flower (not that you can see in the photo) and card number 2 is complete.